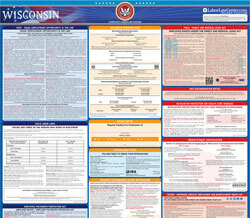 The Workers With Disabilities Paid At Special Minimum Wage is a minimum wage law poster by the Wisconsin Department Of Workforce Development. This poster is mandatory for some employers, including employers with a special minimum wage license. This poster must be posted in a conspicuous place by employers with a special minimum wage license so employees can see it. This poster describes the special minimum wages given to workers with disabilities. It appears you don't have a PDF plugin for this browser. Please see the link below to download wisconsin-erd-9116-p.pdf. requirements. Child labor law provisions apply to employees under 18 years of age. wage license issued by the Department of Workforce Development. This establishment has such a license. similar work, and to the wages paid to experienced workers performing the same or similar work in the vicinity. under Section 14(c) of the Fair Labor Standards Act (FLSA), issued by the US Department of Labor. thereafter for the duration of such employment. a ppropriate, of the terms of the special minimum wage license under which the worker is employed. A request for reconsideration or review under this law must be filed within 60 days after learning of the action.